2017 Cobb Football (CFL) 2nd Grade Superbowl Champions! 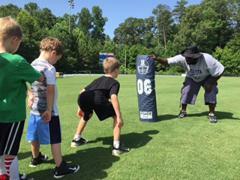 Registration is open for the 2018 season of Marietta Youth Tackle Football! 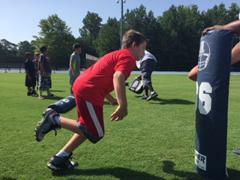 Marietta Youth Tackle Football is a member of the Cobb Football League which is "the official high school feeder program of Cobb County". As part of CFL our youth compete against local rivals such as McEachern, Harrison, Walton, and other feeder program schools from across Cobb and into Paulding and North Fulton. Please visit www.cobbfootball.com and click on the registration links in order to register for this season's football program. The MYFL is under the guidance of Marietta High School Head Coach Richard Morgan and backed by the Marietta Touchdown Club. 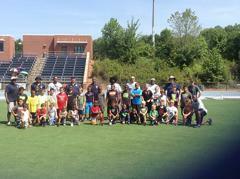 We offer tackle football instruction, mentoring and development for players for K-5th grade. Our program is Heads Up certified for concussion awareness and hitting contact techniques. 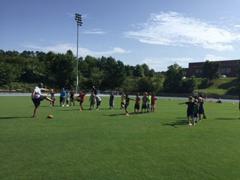 Our coaches are dedicated to our program and include outstanding Marietta community leaders and mentors. Most of our coaches have many years of experience in coaching and all of them volunteer an unbelievable amount of their personal time to be a part of our program. Generally, tackle practices are each Monday, Tuesday and Thursday during football season from 6:30pm to 8:00pm on the MHS Practice Field side of the campus. We also have an active spring and summer workout program to prepare for the season. 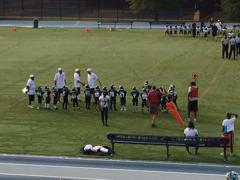 Here We Go... 2015 MYFL Blue Devil Season Begins! Marietta tackle players will be weighed by their team prior to the August Jamboree and as a part of the Certification scheduled for August. The certification weight recorded for each player will determine if the player is considered "restricted" or not for the 2016 season. A player who is over the weight limit the league designates for his division will wear a stripe on his helmet to indicate to the referee that he must play on the line of scrimmage in a 3- or 4-point stance. If not in a stance, a 5-yard penalty will be called. On offense, the stripe means that the player must line up on the line of scrimmage from tackle to tackle. No stripe player is allowed to advance the ball in any way. Once controlled by a stripe player, the ball is "dead". Randy Hawkins is coaching his second year with the Blue Devil Football family. 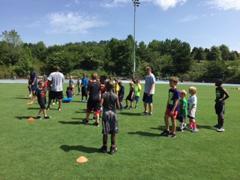 Randy has 3 years of youth football coaching experience. Their sons Jack and Jordon are Blue Devils playing for our 1st and 5th grade teams this season. Clint Austin is starting his fifth year coaching in the Marietta Youth Football League program and he and his wife have three children, two of whom play for Marietta football teams. Clint has also coached youth baseball for several years and he and his wife have both been active in the children’s ministry at their church. Previous to that, Clint worked as a trained volunteer child care provider and he has spent over twenty years reinvesting in children and youth. Clint serves in the military reserves and has completed two active duty mobilizations. In his professional life, Clint owns and runs Old Mountain Contracting Company that provides construction and landscaping services to government and private customers in northwest metro Atlanta. Lanorris Spaulding joined the Blue Devil coaching staff in 2015 as the Head Coach. 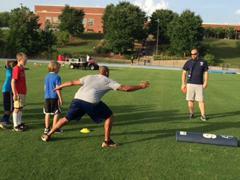 He brings 5 years of coaching experience from Georgia at the recreational and College Prep School level. He came to Marietta after coaching the West Chatham Wolverines in Savannah in 2014 where he served as the defensive coordinator. Prior to that he coached Line Backers at the Atlanta Sports Academy Prep College in Dawsonville, GA after being a head coach and defensive coordinator for the Sandy Springs Saints. Off the field Coach Spaulding “S” is a dedicated Case Coordinator for Devereux Treatment Network, Specialty Foster Care department. Coach “S” graduated from Argosy University with a BS degree in Psychology after attending Bethune-Cookman University after 2 years. In his free time, Coach “S” enjoys spending time with his family and educating others about the game of football. 5th Grade Team - Head Coach Harold A. Spann Jr.
Harold A. Spann Jr. will be beginning his fifth season with the Marietta Blue Devils. He is a graduate of El Camino High School out of Oceanside, Ca. He played college football for Ventura College for 1991-1993 and moved to Marietta, Georgia in 1994. Coach Spann is currently the Seasonal Senior Operation Admin at Alorica. Coach Spann is engaged to Latoya Jacobs. They have eight kids 6 girls and 2 boys. Elexus 20, Salihah 18, Danita 16, Samiya 10, Ashley 10, Jalynn 9, Jordan 8, and Elijah 3. Cameron M. Woods is originally from Chicago, IL. He graduated from Avila University in Kansas City, MO with a B.S. in Business Administration and was a 4 Year Basketball Scholarship Athlete. 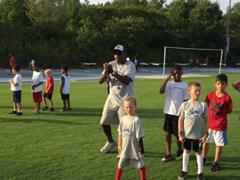 This is Coach Woods' sixth year coaching in the MYFL and he also has coached youth basketball for several years. Coach Woods is married to Tonya S. Woods who is the Parent Coordinator for the MYFL. They have two boys who both play for Marietta teams. Wesley Parkmond will be going into his 3rd year as a coach and his 2nd as the Athletic Director. Originally from Waterbury, CT, he was an all-conference/all-city/all-state linebacker. In college he was a student athlete at Morehouse College and Georgia Institute of Technology. Professionally he manages Delta Air Line, Inc’s energy program in his role as their Energy Engineer. Coach Parkmond is married to Anjaneen Parkmond and has 3 children, An-Nas (14), Amir (12) and Madison (8).